Notes: Clean High Pull DEMO. Be patient as you pull off the floor past the knee, keeping the weight in the heels as you long as you can. This is a great drill in learning to finish with your hips. For some of you that last clean might feel amazing! Keep the weight in a place where you can focus on position. Snatches for Staches! Click HERE to donate to the PCF Team! Notes: No break between planks. Focus on stability in the side planks and kipping those hips in proper position! Man, we have been working hard! Of course I’m speaking of the manly moustaches we’ve been growing this month. There has been such a great response at PCF with raising money and awareness for men’s health for the month of “Movember”. But we aren’t done yet! If you haven’t already, please sign up and join our PCF team HERE. 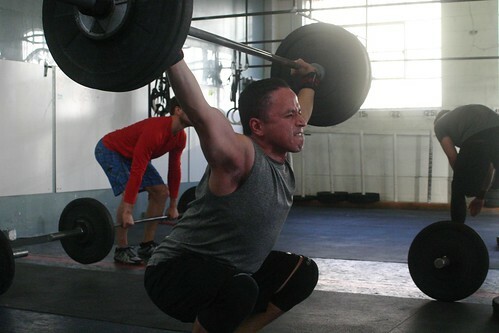 Today, as a gym, we will be performing ‘Isabel’ which is 30 snatches @ 135/95 for time. Because ‘snatches’ and ‘staches’ rhyme so well, it only makes sense that Movember would make it the official CrossFit event of the month. Please come to the box, bring your moustache , and get ready to have a good ol’ time!